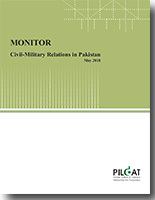 This monitor identifies key developments during the month on Civil Military Relations in Pakistan with selected high-profile international developments. Nawaz Sharif Crossing the Proverbial Rubicon? Spies not Supposed to Chronicle?